Top 10 Best Microwave Ovens in India 2019 - Top 10 In India - Only The Best of everything! LATEST product list, updates regularly! The Top 10 Best Microwave Ovens in India is a great place to choose your next microwave oven. This list of microwave Oven sin India gets updated every day and only features the top bestsellers. That means that you not only get the best but also the latest and all in a convenient daily updated list. Before you buy a Microwave Oven, you should know the difference between a Microwave and an OTG Oven. The OTG oven is actually the oven toaster grill. It does not have any microwaving capabilities and is essentially an electric oven, that is of a smaller size than a microwave oven. The OTG comes with heating rods and does not use electromagnetic waves to heat like a Microwave Oven. The OTG creates high temperatures that lets you bake all kinds of food, and of course also toast and grill. Experts say that the OTG can bakes and grills better than a microwave oven but it cannot be used to heat food or to de-freeze food. To decide whether you should buy a Microwave Oven or an OTG consider what you want to do with it. If baking is your main purpose than an OTG is a great choice, however a microwave oven is much more versatile and lets you cook, reheat and do a lot more. The ideal situation would be that you have a microwave oven as well as an OTG, but if your main purpose is everyday cooking then certainly go in for a Microwave Oven. Every home should have the best of conveniences to make your chores easy and fast. The microwave oven is now a wonderful and almost universal part of the Indian kitchen. 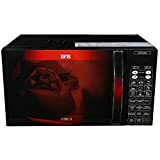 This list of the best microwave ovens in India are updated and refreshed every day to bring you not just bestsellers but the very newest and latest models of microwaves. When you choose one of these microwave ovens you will be picking the choice of many hundreds of Indian buyers. These are tried and tested and they are of a high quality and reliability. So, go right ahead and have a look at this top 10 list and make a great choice for your home. Which type of microwave oven to buy? There are essentially three types of microwave ovens. The first one is the most basic and only has the microwave function that allows you to heat, thaw etc. using the microwave technology. The second one also has the grill option which means that you can bake things in it. The third type has microwave technology, grilling and convection. This means that it will heat the entire oven evenly and you can do much better baking and toasting and grilling. There is a fourth type of oven that is commonly clubbed with these microwave ovens, which is the Oven Toaster Grill. The OTG does not have the microwave option but can evenly bake, heat, grill and toast. The most basic microwave which only has the microwave option and is useful for defrosting, warming cold food, reheating and cooking. These are the lowest priced microwave ovens and are usually smaller in size. This is the next level of Microwave oven sand has both the microwave option and the convection heating option. This enables you to evenly bake a cake and heats up the entire oven cavity through convection heating. This is an oven that has heating elements above and below, and allow you to grill, bake, toast and heat food. It is not a microwave oven and does not have the microwave option.